You don’t need to go miles from land to catch quality reds. Fishing prime reef in low light can often produce some outstanding fish. SNAPPER are a prime target for just about all Aussie anglers. Jamie Crawford provides how-to info to help you catch more of these great sport and eating fish. It was a superb day with light winds, low seas and good tides. The blueys had been running pretty well around the offshore reef systems. I had a couple of mates on board for the day. We arrived at the tuna grounds shortly after sunrise and immediately spotted some fish breaking the surface … Game on! We were pretty confident of a hook-up – maybe too confident – as two hours of trolling and casting passed without even a strike. The fish had pushed deep and the diving terns were now sitting atop a nearby rocky outcrop watching us do laps around them. Our confidence had definitely waned, and I suggested to the guys that we do a spot of bottom bouncing to pass the time until the tuna would (hopefully) rise to the surface to feed as the sun rose higher. I hadn’t bottom fished this particular reef before, but on the sounder it looked pretty good. It peaked at around 35m, and after sounding around we found a nice plateau off the main peak that levelled out at around 50m of water before tapering down into 70m. This is pretty deep for snapper fishing in SA, but seeing as the bluefin were playing hard to get, we hadn’t anything to lose.We stowed the heavier gear and pulled out some 30lb outfits to drop baits down to the reef. I had thrown a bag of squid heads in the esky “just in case”. The conditions were ideal for this deep water fishing, with a change of tide and light winds offering a slow drift over our chosen reef. We’d only have a short window before the tide would start pushing hard again. The first couple of fish lifted over the gunnels were sergeant baker; not exactly what we were hoping for but a handy addition to the bait supply. A couple of tasty red snapper (southern nannygai) were soon added to the ice slurry, along with a couple of pan-sized snapper in the 40 to 50cm range. These fish certainly boosted the morale on the boat. Matt Beckman caught this ripper 10kg red just before sunset. Low light periods definitely coincide with snapper feeding activity. We repositioned for another drift, taking a similar line as before but slightly to the south. There was a good sounding of fish on the bottom, and after we landed a couple more red snapper I set the hook on a better fish. After a typical head thumping fight, the red and blue hues of a nice snapper emerged from the deep. At around 5kg, it was good red for this area. We managed another three snapper of similar size before the tide started moving hard again and the fish disappeared – maybe to sit on the lee side of the reef until the next tide change. It was cool to pull some fish off a reef we hadn’t fished before, and they were probably some of the deepest snapper I have caught here in SA. It got me thinking about the different environments and scenarios we target snapper, and how each scenario has its own place. With differing weather conditions, tides and times of year, it is possible to target snapper year round if you are willing to adapt how and where you focus your efforts on these great fish. I’ll be talking here about snapper here in SA but a lot of the techniques also apply to reddie fisheries in Victoria, NSW, Queensland and WA. The different scenarios in which we target snapper include shallow water, i.e. under 10m. The fishing can be great but often fickle. Then we have the deeper Gulf waters. This is the most popular (and arguably the most consistent) snapper fishing here in SA. This is fishing in water from 15-30m deep, and is where we see the bulk of our bigger reds. Then we have the deep water option, as detailed above. This is generally fishing offshore in ocean waters in depths from 30m and deeper. The last fishing scenario covers land-based fishing for snapper, when water clarity and timing is important. Snapper from the shore can be a challenging quest here in SA. In this two-part feature I’ll break down each of the above snapper fishing scenarios to look at when each of these situations comes into their own. We’ll look at how to best tackle each scenario, how the fishing differs, and will provide details on when to target one scenario over another. I’d have to say that fishing for reds in shallow water would be my favourite form of targeting them. Seeing a good fish appear in the berley trail, then watching him take a bait or plastic before scorching through rock-studded shallows is heart-in-mouth stuff. Although the average size of these shallow water fish is generally relatively small, it is still possible to land some great fish to 7-8 kilos from shallow water. Most inshore sessions would see us land one decent fish above 60cm; but it’s the consistency for “plate size” reds on light tackle that draws us inshore. But why would we choose to target smaller fish inshore when bigger snapper are available further offshore? Firstly, the bigger reds in our Gulf waters aren’t available all year; like a lot of other species, they’re subject to seasonal migrations. When the conditions are right and the snapper are holding over structure, the fishing can be amazing, but there is a lot of down time on these wrecks and reefs too. The shallow water fishing, on the other hand, is pretty consistent, offering action almost year-round when the conditions are right. We see runs of bigger fish over these reefs at certain times of the year, but the typical 40 to 50cm “rugger snapper” are the mainstay fish on these reefs. Berley is a must if you want to get snapper on the bite around areas of scattered reef. One of the big advantages of targeting the inshore grounds is the accessibility. Some of the best inshore reefs we access are only 10 minutes from the boat ramp, so it comes down to the time factor. Sometimes you only have an hour or two spare, and these inshore sessions are certainly do-able in that time frame. Also, the weather forecast might be questionable to head offshore, and rather than run the risk of a long and rough trip home it can be better to fish inshore, offering a quick run back to ramp should the weather turn foul. And targeting pan-sized reds in shallow water is a heap of fun, no matter what some of the “big snapper” purists might say. Scaling down to 2-4kg spin outfits helps to bring out the best in these fish. These inshore reefs don’t fire every day, and are dependant on the conditions to trigger a good session, so it comes down to making a judgement on whether the conditions are right for your local area. When fishing inshore reefs we look at three main factors: water clarity; tides; and time of day. We steer clear of the shallow reefs after a prolonged calm spell when the water is clear. But following a blow or during periods of bigger ground swell these inshore waters are stirred with fine matter. Good tides help to keep this matter suspended, and for some reason the cloudy water triggers the snapper into feeding. Whether it’s from the cover it offers or from suspended food we’re not entirely sure – all we know is when we arrive at our chosen reef and the water is dirty we get excited. The main reefs we target inshore are nuggets of limestone surrounded by broken bottom in around 4-8m of water. We aim to anchor over the broken bottom surrounding this structure, and then begin a berley trail. The best time to hit these inshore reefs is during the hour following sunrise, and again in the final hour of light before sunset. Fishing small baits or plastics through the berley trail is the key over these shallow grounds. Of all the snapper fishing scenarios, fishing land-based definitely offers the greatest challenge. Landing snapper from the shore with any sort of consistency is no easy feat. Snapper can be caught from a variety of land-based environments including man-made jetties, piers, and breakwater groyns, and also from the surf at certain locations. Here in SA we pull some good reds from our remote surf beaches from September to November (although they are more silver than red from this environment). However, targeting snapper from the rocks is the most common form of land-based fishing for them, so that’s what we’ll focus on here. To target snapper from the shore, we’re actually looking for similar conditions to what we would when fishing inshore reefs. Dirty water, good tides, inshore structure and fishing dawn and dusk periods are all important factors when chasing snapper from the stones. Why would we pick fishing land-based over fishing from a boat? As well as suiting those fishos without a boat, it’s one style of fishing that actually gets better the rougher it gets. So on those days when it’s physically too rough to launch, it’s still possible to hit the stones to get your snapper fix. Shallow water snapper like rough conditions. But while they may like it rough, the windier it gets, the harder the conditions are to fish in. We normally have a cut off of around 20 knots; anything stronger becomes too difficult and dangerous to fish in from the rocks. It goes without saying that standing on wind-swept rocks is the last place you want to be when the swell is pumping. Always study the conditions before venturing onto your local rock platform. The rocks we’re accustomed to fishing from for snapper are within Gulf waters, so while it gets choppy it lacks the heavy ground swell that’s seen along more exposed coastlines. If you time your run well, you can fish these rocks directly after a blow while the inshore water is still stirred but you don’t have a stiff headwind to contend with. But if it’s been blowing for a few days it can choke these shore-lined grounds with weed, making it difficult to fish. When fishing from the rocks for snapper, I use a typical surf-casting outfit. 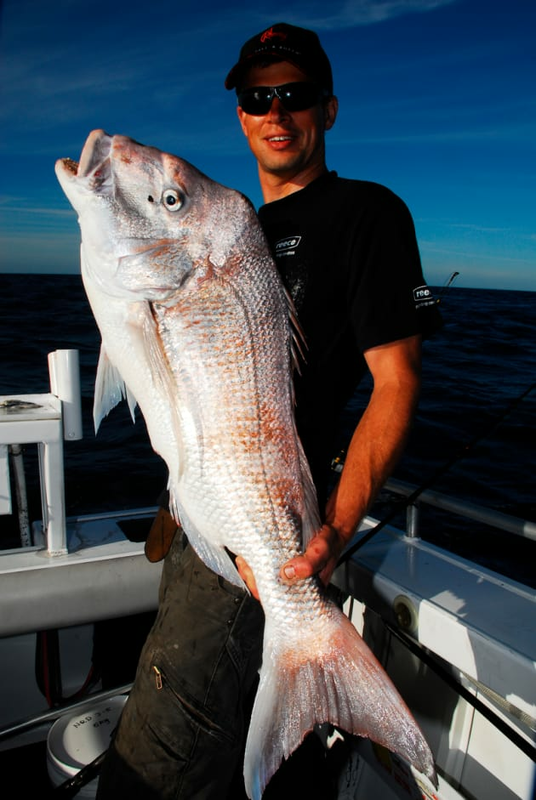 Something in the 9-10ft range and rated at around 8-10kg is ideal for land-based snapper fishing. Rod selection is vitally important in this situation, as you will need to punch 3-4oz of lead into a head wind a lot of the time, as well as using the rod to steer hooked fish away from the reef. 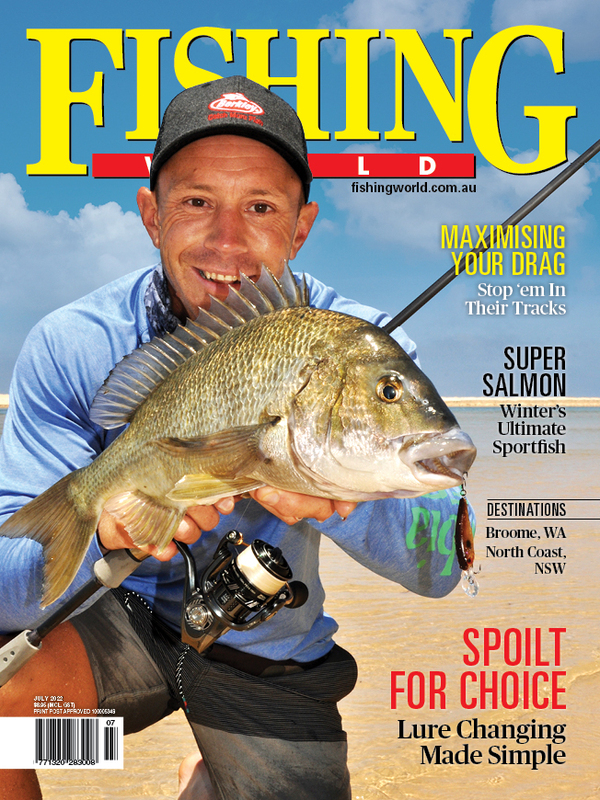 Well, we’ve discussed shallow water and land-based snapper fishing in this first feature. Stay tuned for the second instalment next issue where we’ll detail fishing medium depth structures in bay and Gulf water settings, as well as targeting big reds around the deeper offshore reefs. Jamie went offshore to target tuna but turned his attention to snapper when the SBT proved elusive!